A foundry was, at one time, an essential part of any engineering factory. Castings formed the basis of most machines – including the machine tools on which the castings were milled, drilled and bored to their final shape and dimensions – up until the last part of the twentieth century, when castings began to be replaced by cheaper fabrication technology. Sand casting – a mould of the desired article being made by forming a shell of sand around a pattern, which is then removed and molten metal poured into the void, taking up the shape of the pattern – has been used for several thousand years. The ancient Chinese produced some of the best bronze castings in the world for any time in history. In what is now Iraq, there were natural draft iron furnaces with so much production that scientists think it altered the atmosphere of our planet. There is a mine in France where man has been mining foundry sand for hundreds of years. It is still considered the best naturally bonded moulding sand in the world. In the period immediately after WW2, when Baker Perkins was struggling to meet the demand from its customers to help get them back to pre-war levels of production, the foundry at Westwood Works had not sufficient capacity to supply the needs of the engineering works. In particular, there was an urgent call for lighter castings, and in 1946 the Alliance Foundry at Luton was acquired. (See also – History of Alliance Foundry). After a time, when the demand for Westwood Works became less urgent, the Alliance Foundry had sufficient capacity to supply castings to other firms, and this became a regular part of its operations. The Future Development Committee, set up by the board of Baker Perkins Ltd in 1954, had decided that the company had only a limited range of equipment to serve the growing chemical industry. 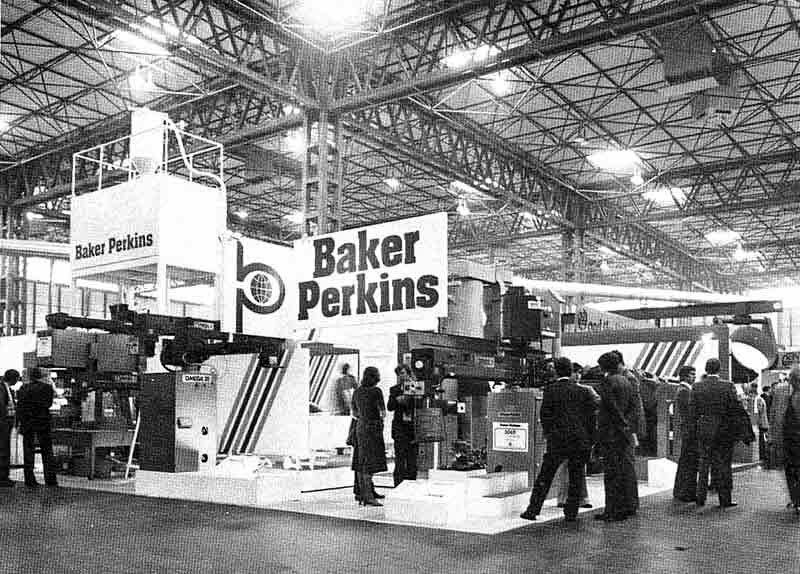 John Peake was given the task of analysing potential opportunities and developing Baker Perkins Ltd’s presence in the ‘chemical’ machinery business. (See also History of Baker Perkins in the Chemical Business). John recalls that, as part of these deliberations, - “We were encouraged to consider the foundry industry by our association with our own foundry and particularly Alliance Foundry. Reg Dean who had experience in the foundry industry joined the Division and K.T.J. (Kenneth) Bone who had sold Alliance to BP acted as our consultant". Reg Dean remembers – “Baker Perkins started the foundry business in 1955, I was engaged to start the sales and I managed that business from the start, in Bedewell, and later in Peterborough. It was merely an adjunct of Chemical Machinery sales. It was mainly to boost the sales of Chemical Machinery". In the light of Baker Perkins Inc’s success with continuous sand mixers their drawings were used to build one and install it at Alliance. This machine was smaller than any that had been built in America as foundries like those of General Motors in Saginaw had huge output requirements. Although no mixers of this design were sold, others based on the ribbon blade and with smaller outputs were developed successfully later. Furthermore, the experience with sand led to applications with many other materials. Shell moulding was a relatively new process that was gaining ground in the industry. A single station prototype machine had already been designed by Jack Hucklesby and tested successfully in the Experimental Dept. John Peake and Ralph Hindle had then designed fully automatic three-station machine. Rotating Barrel Shot Blasting M/cs. Sand Blasting M/cs. – a license to build the range of French “Sisson-Lehmann” shot blast machinery was granted and a number of these machines were sold in England”. In America Russ Taccone had developed a method of compacting the sand round a mould using compressed air with a diaphragm. For high outputs the compression station was integrated with an automated production line thus eliminating the need for numerous "jolt-squeeze" machines and the individual box handling which that entailed. There was a successful installation in (?) in Scotland in which the many complex movements of the boxes were controlled by Post Office telephone selector switches. Sadly a similar one at Dartmouth Autocastings did not quite make it. Reg Dean remembers his first visit to Taccone as taking place in 1956 and puts the date of the Dartmouth Autocastings installation as 1960. 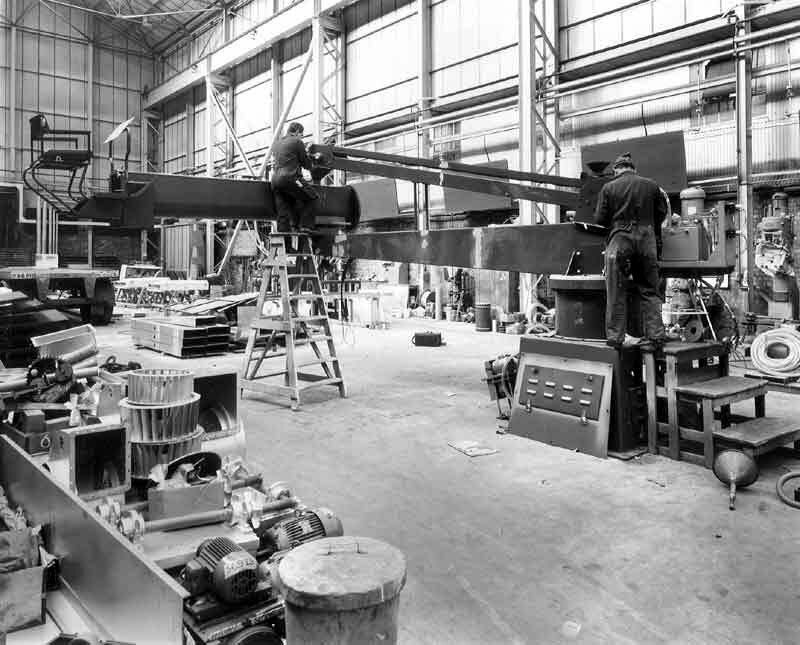 For many years, the mainstream activity of the Foundry Machinery business was the design and manufacture of a range of continuous mixers for chemically bonded sand processes. The management, sales and design functions were based at Westwood Works with manufacture being carried out at Baker Perkins Ltd’s Bedewell Works. Chemically bonded sand systems are widely used in foundries for making moulds and cores. There are many processes but all depend on mixing sand with a binder system, which is designed to set the sand hard after a short period of time. Typically, the binders are organic resins, which could be catalysed by the addition of an acid catalyst in order to set very rapidly, or inorganic liquid such as sodium silicate. It soon became clear that these chemical systems offered many advantages over the traditional, so-called green sand moulding process, especially in jobbing or medium-run foundries. A further advantage was that it became possible to reclaim the sand after moulding, so that it could be re-cycled time and time again. CHEMICALLY BONDED SAND MOuLDING – The process. Some chemical binder systems will bond or cure the mould through a chemical reaction established during the sand and binder mixing cycle, while other chemically bonded moulding processes may require gassing of the sand mixture, or heat applied to the sand mixture to complete the cure. The simplicity of the chemical system usually makes quality control less complex and results more consistent. Shell Moulding (organic) - Probably the earliest, most automated and most rapid of mould (and core making) processes was the heat-curing technique known as the shell process. Resin-bonded silica sand is placed onto a heated pattern, for a predetermined time. Ejector pins enable the mould to be released from the pattern and the entire cycle is completed in seconds depending upon the shell thickness desired. The two halves of the mould, suitably cored, are glued and clamped together prior to the pouring of the metal. Shell moulds may be stored for long periods if desired. Because of pattern costs, this method is best suited to higher volume production. Designers should seek the advice of the foundry to ensure that all the benefits of the process are achieved. No-bake Moulding (chemically bonded, self-setting sand/organic) - Since their introduction, furan and urethane no-bake binders have gained wide acceptance for the production of moulds and cores for producing metal castings. The advantages, regardless of which resins are used, are based upon control of the setting times by means of the addition of specific amounts of catalyst. This feature, combined with high strength and a desirable range of hot properties for use with various alloys, presents the opportunity for great flexibility in mould making. To produce a mould using no-bake binders, the pattern is covered to a depth of 4-5 in. with the no-bake sand mixture. The sand is allowed to set completely and the flask is then filled with conventional backup sand or, as the sand becomes tacky during its setting up period, the backup sand may be added with a sand slinger. If ramming energy is applied before the sand sets, the density of the sand mass at the pattern surface is increased. This is reflected in a better casting finish. Furan-type resin binders were originally introduced in 1958 as an acid- catalysed no-bake furan binder system. Two years later, the automotive industry modified the resin to operate with an acid salt catalyst for use as a hot-box core system. Then, in the early 1980s, furan resin became the largest resin binder consumed, and today it remains as the largest selling no-bake system. In 1922, the Quaker Oats Company were able to commercialise furfural production by treating oat hulls from their cereal mill in Cedar Rapids, Iowa. For decades, annually harvested agro-wastes like corncobs, sugar cane bagasse, cereal by-products or pulping wastes make up a bottomless renewable feedstock for furfural production. Furfural is the sole industrial source for furfuryl alcohol, tetrahydrofurfuryl alcohol, furoic acid, furfurylamine, methylfuran and furan. 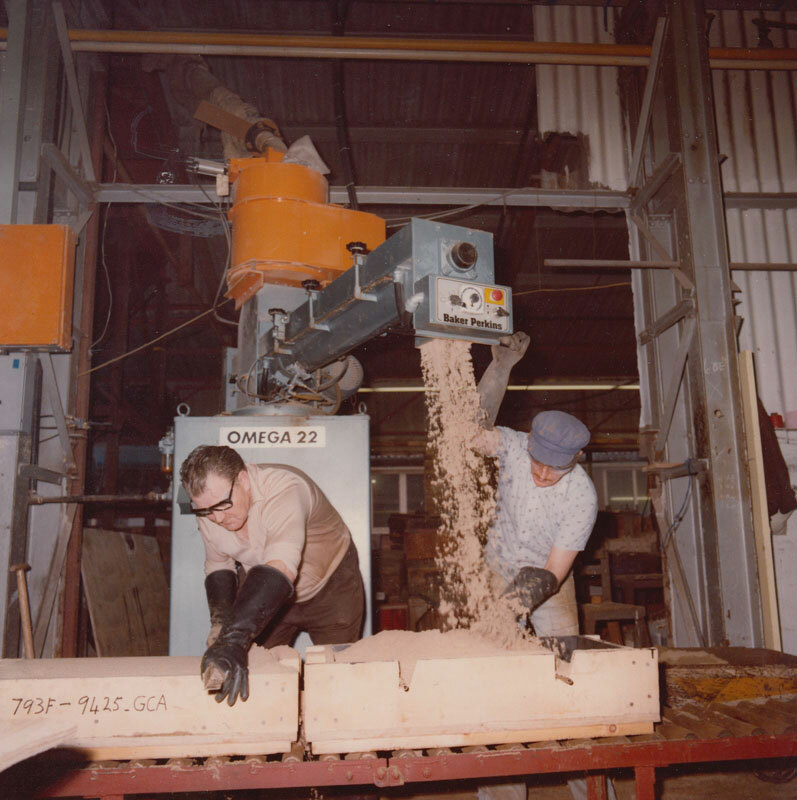 Since the 1960’s and 70’s, furfuryl alcohol resins have replaced oil based binders in the foundry industry. 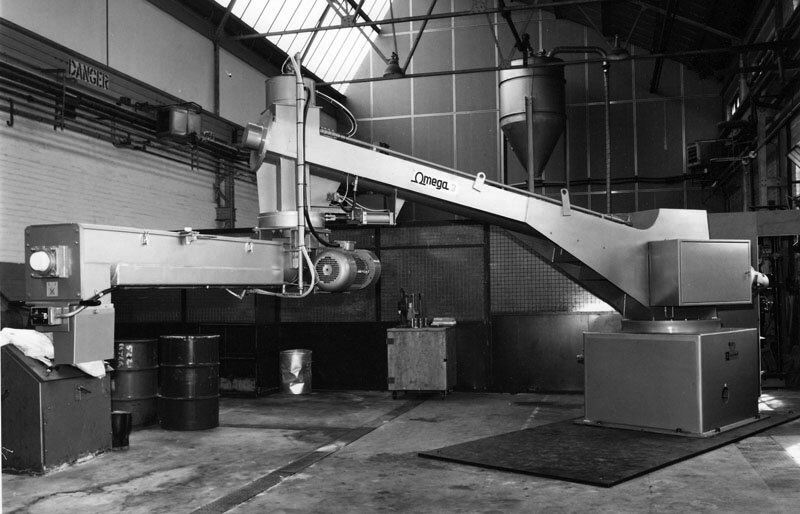 Baker Perkins Ltd was quick to see the future of chemically bonded sand and developed the original range of Ribbon Flow mixers, which proved to be very successful. These early mixers were a fairly simple design, comprising a U-shaped trough in which a horizontal shaft with curved, bolt-on mixer blades rotated at relatively low speed (100rpm) to perform the mixing operation. The trough assembly was normally mounted on a swivel ring on top of a cabinet containing the electrical controls, pumps with non-return valves etc. The need for a furan sand reclamation plant had grown over the previous four years as the “No-Bake” process had gained ground in foundries throughout the world. The process, which involves mixing small amounts of furan resin binder and phosphoric acid, as a catalyst, with dry silica sand, has many advantages. However, until May 1967, when Baker Perkins Ltd introduced a plant to reclaim Furan waste sand, the sand could only be used once. Foundries using the “No-Bake” process have had to buy between 20 and 100 tons of silica sand every day and then pay to have it taken away and dumped. The Baker Perkins plant – a typical one could reclaim 10 tons per hour – did away with the procession of sand lorries to and from the foundry. The plant consisted of a series of crushing, grading, and elevating units arranged in sequence to reduce the furan sand lumps to grain size, completely free of dust and fines. After some years, the introduction of ever-faster setting resin systems rendered the Ribbon Flow type of mixer obsolete. Systems became available which could enable sand to set in well under 5 minutes. If the sand mix remained in the mixing trough longer than the set time of the sand, it set solid within the trough and gave rise to very difficult cleaning problems and high blade wear. 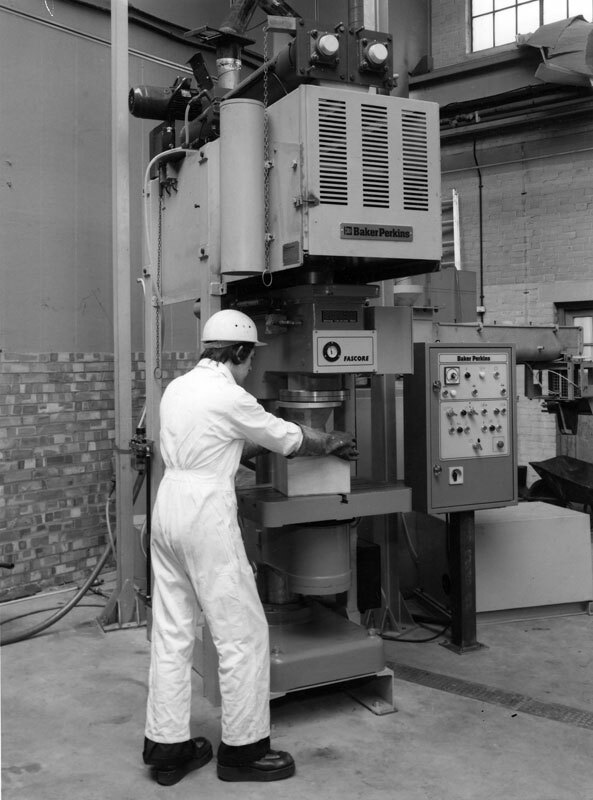 The challenge was to design a mixer which could cope with very rapid set times in the moulding box, without sand setting solid in the mixer trough, either during the mixing cycle or when the mixer was stopped by the operator after delivering the required amount of sand to the moulding box. This was a problem, which challenged every foundry machinery manufacturer at that time. Arthur Ferns remembers – “At this point, Baker Perkins was fortunate to have an engineering manager of considerable ingenuity in Albert Edwards. Albert was a practical foundry engineer of what might be described, nowadays, as the ‘Fred Dibnah style’. He developed an entirely novel approach to the problem by essentially combining two mixers into one”. The first stage comprised two U-shaped troughs similar to the old Ribbon Flow type, which were arranged horizontally, side by side. Resin was injected into the sand with air assistance through a slot on the side of one of the troughs, while catalyst was injected through a nozzle and mixed with the sand in the adjacent twin trough. In this way, the pre-mixed resin sand and pre-mixed catalyst sand were kept separate and would not begin to harden until they were brought together in a second stage, vertically mounted high speed (900rpm) batch mixer. Two sizes of mixer were developed, known as HSM3 and HSM12, referring to output of 3 ton/hour and 12 ton/hour, respectively. 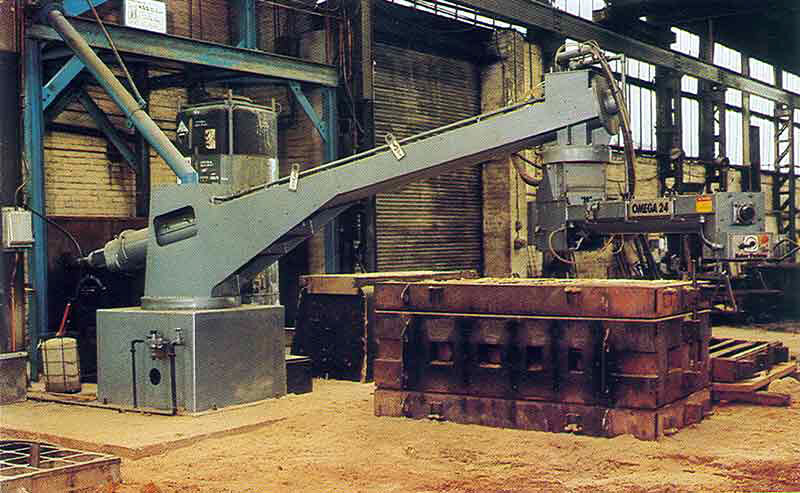 This was a major technical breakthrough and Baker Perkins HSM mixers came to be used in foundries throughout the world. From Jan 1 1970, a new Chemical and Foundry Division was formed at Peterborough, with R.C. Dean – divisional manager, J.C. Hucklesby – technical manager, A.W.D. Ferns – manager W+P equipment sales, J.H. North Sales Manager and G.C. Chestney – office manager. The two parts of the division were, effectively, two separate divisions under one roof and the foundry machinery business continued to rapidly expand its position in the chemically-bonded sand machinery sector. Since the HSM mixer design could process very fast setting sand systems, it opened the way to using chemically bonded sand for core making operations and a variation of the HSM could be linked to a core shooter, typically for gas-hardened core making processes. 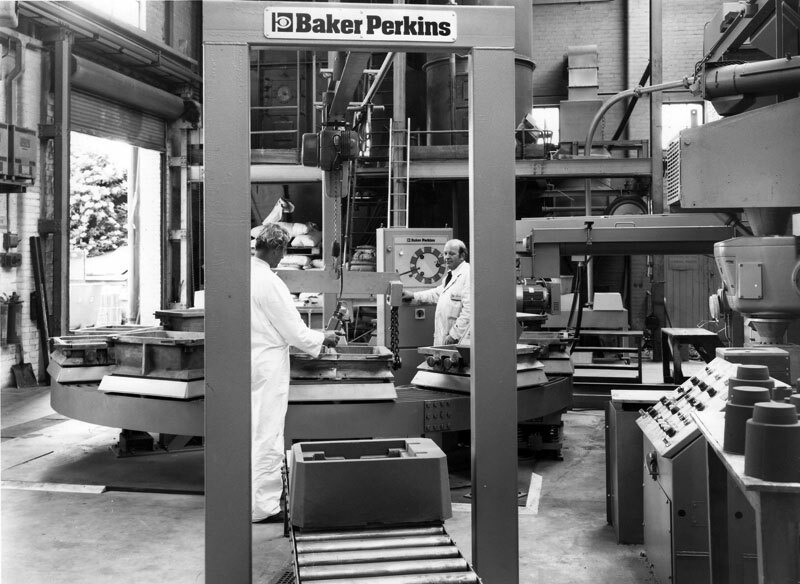 In 1972, Baker Perkins Ltd demonstrated the machine that it hoped would revolutionise the making of cores in foundries throughout the world. 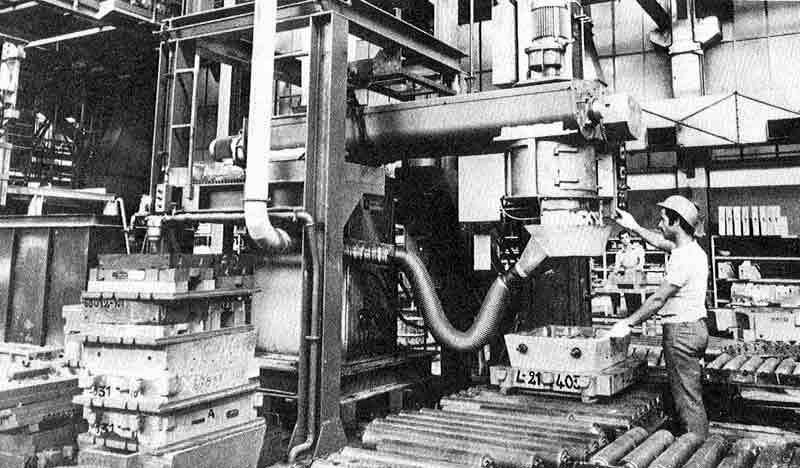 The machine was called Fascold and had been developed jointly by the British Cast Iron Research Association and Baker Perkins Ltd. Fascold produced cores at shop temperature, without heat and without toxic gas, a real advantage over many production methods that generated a lot of heat and created unpleasant working conditions. Because the process was cold, any type of core box could be used – plastic, wood or metal. Fascold took just 30 to 45 seconds to produce a core, and could be set automatically to produce cores varying in size and weight. In the Fascold system the sand was treated chemically to produce a mould or core of very high strength. Such was the strength of the Fascold mould that it required much less sand than in the old methods. So the foundryman saved in material costs and the amount of effort in handling moulds. In turn, a casting was produced that was accurate and required little finishing work. The Fascold process was used in foundries in every continent for producing every type of casting from cylinder blocks, pumps, machine tool parts, central -heating equipment to irrigation plant, crushers and dredgers. In traditional methods a complicated mould could take many hours to make, with Fascold, it could be made in minutes. “We began as a small team - Albert Edwards - development manager; Geoff Holland - electrician; Jack Haley - outdoor engineer and me. Meetings had been held with staff from the British Cast Iron Research Association (BCIRA) to discuss an outline scheme for a new method of bonding sand to make cores for use in foundries. The concept was to mix sand with a resin, then another portion of sand with a hardener and finally mix the two evenly together. The sand would set with a degree of hardness in a given time dependent on the proportions used. The BCIRA could only make small quantities with difficulty; our task was to develop a machine to make cores of a commercial size. Albert Edwards set a target of 3 to 5 lbs in weight. A section in the Experimental Department was set up with an admin office and a drawing office together with an area on the shop floor. A supply of resin and hardener with which to experiment was obtained from Borden Chemicals. Progress was slow because we had to determine the best type of both. The Borden representative brought a new batch every week, to a new specification that reflected the previous week’s test results. The hardener we used was a strong acid and we began to experience some strange physical effects, particularly Jack Haley. When I joined the section, Jack Haley and Geoff Holland had already set up a ‘RibbonFlo’ twin barrel mixer and an old core blower on the shop floor. My job was to design a method of mixing the output of the twin tubes of the RibbonFlo so that we could make cores. We eventually produced a circular bowl fixed to the outlet end of the tubes; the top was fixed, the bottom removable for cleaning. The top had an electric motor driving a shaft to which was attached a blade with two scraper blades scraping the sides and two blades scraping the bottom. The mixing was good, but the blades kept building up with lumps of sand setting on them. We tried many things and eventually used fixed blades of spring steel. The vibration of the blades touching the sides and bottom kept them clean. We could now progress. A test operation was started. I had to make as many cores as possible in one day to prove the system. I worked all day and made 109 cores, all perfect, but the machine was covered in a layer of core sand that had set hard. The compressed air used to blow the cores had covered the machine with sand particles, coated with resin, which had then ‘gone-off’. We had to start again. By this time, the health hazard began to become more obvious. The acid in the hardener had eaten holes in my shoes and my clothes had little holes in them. I was supplied with plastic overalls, work boots and safety glasses. Jack had seen his doctor because of chest pains and Geoff and I were having occasional breathing problems. After investigating, it was thought that the fumes generated by the process were causing this. Work was temporarily stopped as the process was considered too dangerous. I was then asked to prepare for a French company to work on our system, using their own materials. This visit took place secretly over a weekend. When I went to work the following Monday, it appeared that they had been, worked unsuccessfully and returned home. They left behind two half-empty barrels containing the materials they had used in their experiments. Borden immediately seized these and soon returned with a new formula. It worked - and they had eliminated the health hazard. We continued with developing the machines and, eventually, the section pronounced ‘Fascold’ as a going concern, and we designed a range of mixers that were then sold to the foundry industry worldwide. Foundry sand is special and very expensive and the next product produced by our team, which by this time had increased with the addition of Douggie Bevan, was a machine able to reclaim most of the sand used with our system, something that had not been possible before. As a result of the interest generated by the new machines we had a visit from a foundry managers’ group in Japan. Forty members flew to England, Baker Perkins employed an interpreter from London, and a day was spent in the Experimental Department during which I demonstrated the machines. Albert Edwards, although proud of our achievements, was not really happy because of how complicated the process was. 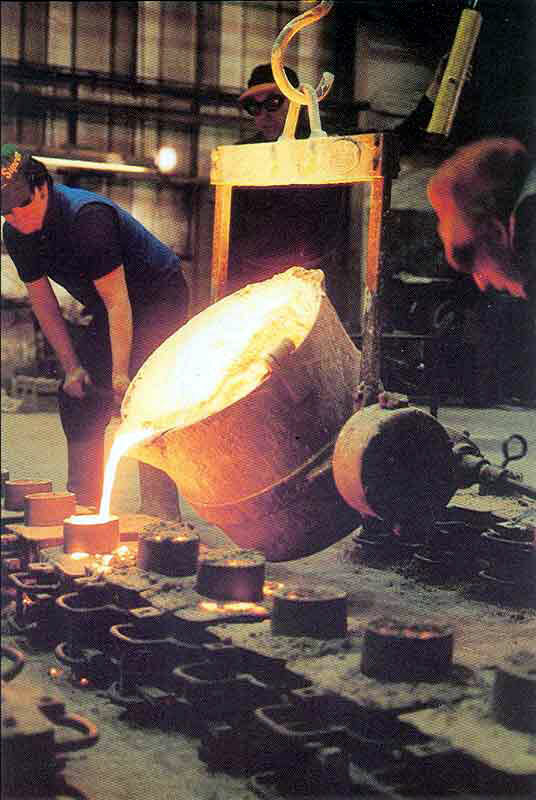 Other foundries used a competitor’s mixer, using sodium silicon as a hardening medium, activated with a gas. We set about designing a machine to do this with water as the hardening medium and produced, after several difficulties, a new range of mixers, called the Omega range – see below." 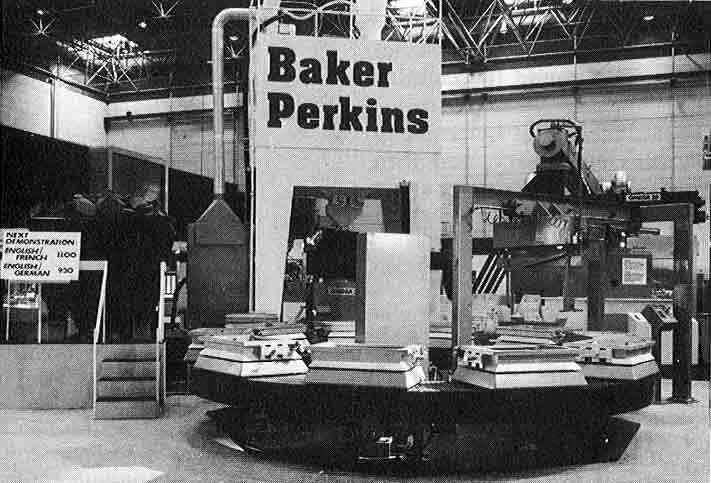 In 1973, things were going well for the foundry department and a new company, Baker Perkins Foundry Machinery Corp., was formed in Elmhurst, Ill, USA under W.K. (Bill) Graham as manager. In the same year, Baker Perkins’ foundry interests were further strengthened by the acquisition of Gibson Engineering of Chippendale, NSW, Australia., who had for a number of years been suppliers of foundry machinery complementary to Baker Perkins’ range. In the following year, the department announced that order taking was running at twice the rate for 1973 and £850,000 of Fascold machines had been sold since its introduction. The Werner & Pfleiderer agency ceased in 1974 (See History of Baker Perkins in the Chemical Business) and Arthur Ferns moved over to the foundry side of the business. 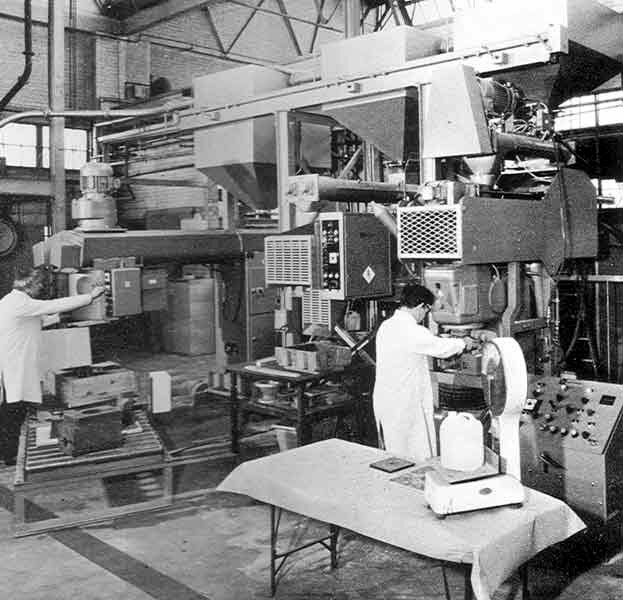 The concept of the Fascold machines was so innovative that Baker Perkins won the prestigious Queen’s Award to Industry for Technical Achievement in 1975 in respect of this development. At that time, no other Division of Baker Perkins had received this distinction. (NOTE: Confectionery Developments of Hemel Hempstead had won the Award for export achievement in 1973 – the same year that it joined the Baker Perkins Group). Sales in 1974 amounted to £726,141 of which £669,848 were for export. The lifespan of any product is finite and the inherently high cost of the HSM design, because of the multiple mixer components, prompted attempts to find a simpler and less costly solution to the enduring challenge of mixing sand/resin systems with rapid set times. Again, Albert Edwards came up with a highly original engineering solution to the problem. This resulted in the now famous Omega range of continuous mixers. For simplicity, the design returned to a single U-shaped trough in which a belt driven shaft rotated at 600rpm. A variety of mixing blades with hardened tips were bolted to the square-section shaft. This was fairly conventional, but there was one additional feature, which rendered the design truly revolutionary. Each time the operator stopped the mixer (e.g. when the mould box was full of sand) a fine spray of aqueous alkaline solution was automatically injected by compressed air through a series of 1mm diameter holes positioned at intervals along the length of the trough. This became known as the ‘inhibitor’ system. The effect of this very fine spray was to neutralise the thin liner of residual sand that occupied the gap between the mixer blades and the trough wall, thereby keeping it from hardening. This gave the omega mixer major advantages in terms of ease of cleaning and reduced blade wear (because the residual sand liner remained soft). To make cleaning even easier, the mixer trough was designed with a hinged bottom door arrangement so that the entire bottom of the U-shaped trough dropped open to reveal the shaft and blades. A lift-off top cover completed the total accessibility for cleaning and blade change. This trough design, combined with the unique inhibitor system, made the Omega mixer unusually easy to clean and maintain. This was important since hitherto cleaning had been a difficult, time-consuming and unpleasant operation for the foundryman. Pivotal, articulated and mobile versions of the Omega design were developed. "I was sent to Erie as Exec. V.P. of the business in 1996/1997. We operated a small factory where we assembled mixers, held spare parts and kept a stock of machines for sales in USA, Canada and Mexico for the most part and had service engineers on site to provide service in these areas. The factory and offices were located at 410 East 10th Street, Erie, PA. Apart from myself, there were 2 other Baker Perkins ex-pats involved in the business full time, namely, Bill Graham (VP Sales) and Alan Francia (Office Manager)". “The Foundry department at Peterborough had been operating through a separate local agent in Sao Paulo, Ashland Resinas Sinteticas Ltda, but had run into difficulties with a number of sand mixers and reclamation units stranded at Peterborough awaiting import licences. BPSTI was asked to help and because of its experience was able to explain the various procedures necessary to obtain licences and foreign exchange, which eventually cleared the backlog. However, it became increasingly more difficult to obtain licences because of strong local competition and also to justify to customers the increased cost to them of imported machines. A decision was therefore taken at Peterborough that in order to remain in the Brazilian market, the only way was to manufacture locally. This was channelled through BPSTI and an arrangement was made with Werner & Pfleiderer do Brasil who had a factory on the outskirts of Rio de Janeiro, to assemble some foundry machines with certain imported key components. Altogether, 1 x Basic I sand mixer, 5 x HSM 12 twin screw mixers and 1 x Sand Reclamation Plant were built. However, profit margins were low and Ashland found it was still difficult to sell the machines. Eventually they resigned and the agency was taken over by Morganite do Brasil Ltda”. A giant Omega mixer was built at Bedewell in 1980 for delivery to Budapest. It had a capacity of 35 tons per hour, a reach of 7 metres and its 300 litre resin tank and 100 litre acid tank were integral with the machine. 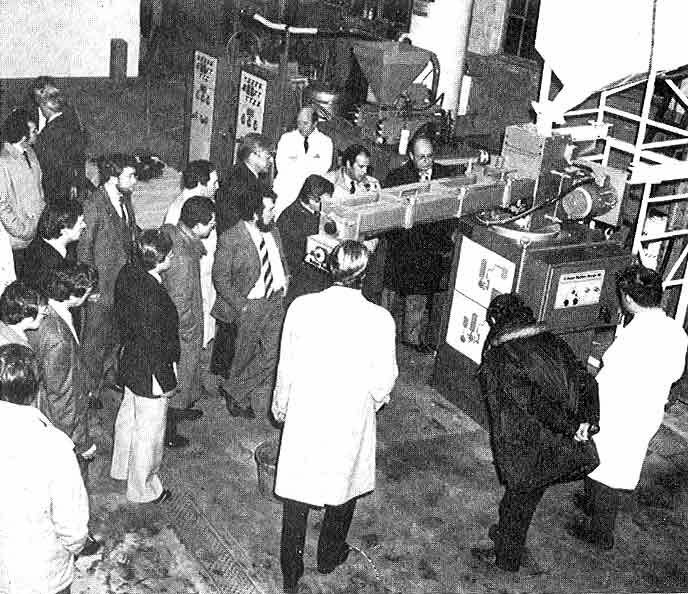 In late 1981, a new sand reclamation machine – an updated Gamma-mill reclaim unit and a totally new cooler/classifier, dust extraction equipment, water cooling tower and pneumatic conveying system - was demonstrated to the department’s agents. Significant improvements had also been made to the Omega mixer with some significant improvements in simplicity of design, maintenance and access. There were some signs of optimism in 1982 despite the extreme recession in the industry and a new sand-reclamation plant, the “Gamma-Vator” was launched towards the end of the year, part of the BZV range of BZV cold-box foundry equipment being marketed by the foundry machinery department. The “Gamma-Vator” was designed to shakeout, reclaim and classify chemically bonded sand and was demonstrated together with the latest version of the Baker Perkins Omega mixer to over 100 foundrymen from all of the UK. 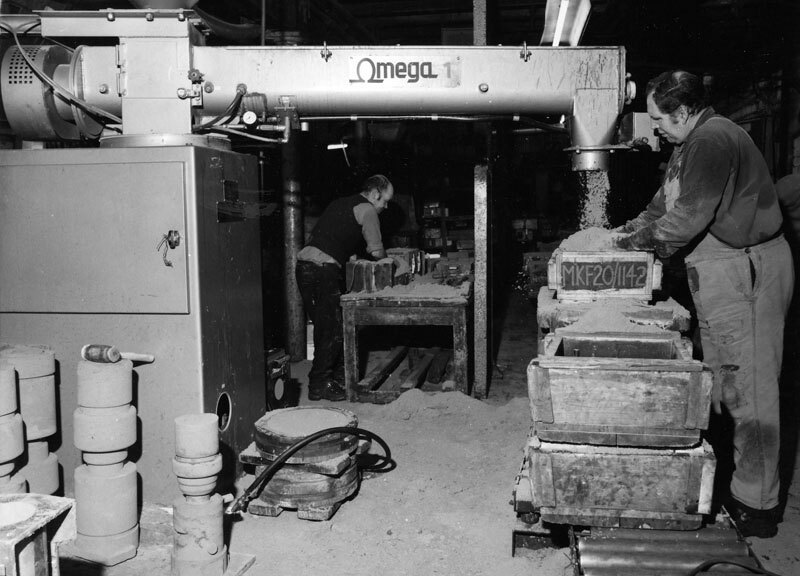 The BP Omega Mixer and the range of BZV foundry equipment were shown to over 100 foundry men from all over the country. 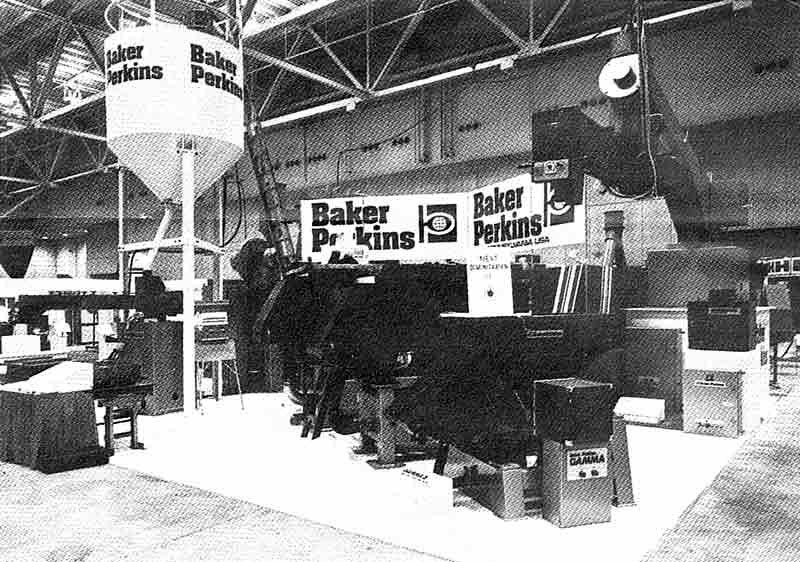 In Summer 1983, Baker Perkins introduced a new continuous mixer for core sand, designed for any of the gas hardened processes – CO2, SO2, Ashland cold box, etc.. The new “Delta-mixer” had a number of advantages, including compact size and easy maintenance. The “Delta-mixer” offered high quality mixed core sand at the point of usage, and eliminated mixed sand distribution problems often associated with batch mixing. 31/3/81 – “World markets continue to be depressed and sales were little changed. A small loss was made". 31/3/82 – “In spite of lower sales, an improved contribution was made to overall profitability”. 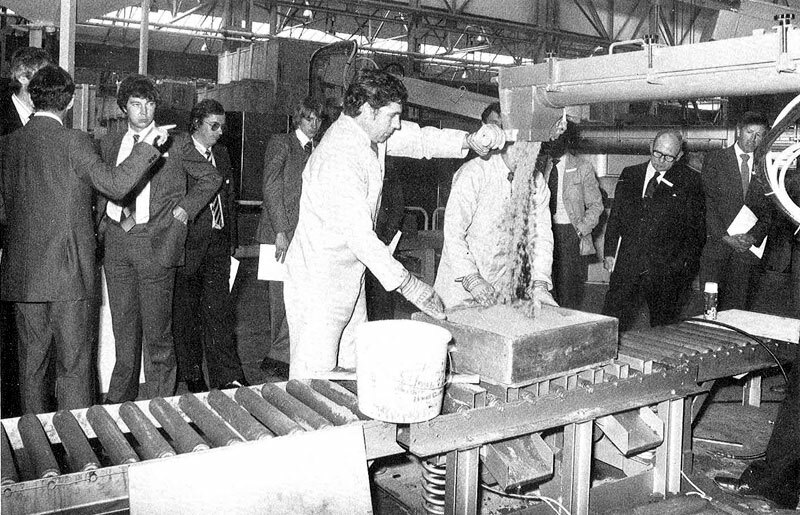 31/3/83 – “Conditions for business within the foundry industry continued to be extremely difficult, but a useful contribution was again made to overall profitability”. The Foundry machinery business was sold in Autumn 1984 to its manager since 1980, Arthur Ferns. It had achieved and maintained a leading position in the industry for over 25 years. Arthur formed a new company called Omega Foundry Machinery Ltd with manufacturing facilities in Orton Southgate, Peterborough. The company remains in business, successfully marketing equipment to the foundry industry, to the present day. “Having a technical innovation in a very large mature but basically depressed industry caused us to explore the route of design for economic manufacture and Charles McCaskie used all his formidable energies to that end. When that approach did not yield the hoped-for result we looked at the overhead structure and decided that the product, basically a light fabrication, could not support the full overhead of a factory the size and weight of Bedewell. Our stance was that we did not want simply to remove a management problem that we could not solve, but wanted to make it a success in our local environment. It was a credit to Arthur and to Chris’s ingenuity that the business survived”. Is anyone out there able to identify these machines, please?